Each Wednesday the Ecology and Evolution department run a journal club called Noon Illumination, and this week I volunteered to lead discussion on a recent article titled Resource Partitioning and Sympatric Differentiation Among Closely Related Bacterioplankton (Science 320: 1081-5), by Dana Hunt and colleagues based at MIT and Ghent. I originally prepared the presentation for a Bacterial Metagenomics workshop in Berlin this July, organized by Daniel Falush. Of central interest in the paper is a novel methodology that infers habitat/niche based on ecological variables and DNA sequencing in the family of marine bacteria Vibrionaceae. That places it in the wider context of methods that attempt to predict phenotype (in this case niche) from genotype. Their approach is an elegant extension of familiar phylogenetic methods to model habitat switching over evolutionary time. Based on arguments put forward by Christophe Fraser and colleagues, the paper reasons that the ancestral habitat switches they detect are likely to be adaptive because the rate of recombination eclipses the mutation rate sufficiently to preclude the possibility of neutral genetic clustering. However the high rate of recombination raises some difficulties of interpretation. 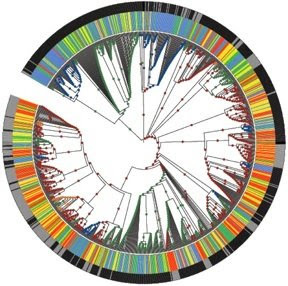 The principal phylogenetic reconstruction was based on the hsp60 gene, but by sequencing other housekeeping genes, Hunt and colleagues found that in some cases, recombination between genes caused an artefactual habitat switch in the hsp60 ancestry that was not evident in the other genes. Using a permutation test, I found evidence for recombination within the vibrio hsp60 genes, which may confound the phylogenetic reconstruction of evolutionary relationships (Schierup and Hein 2000). On a more philosophical note, suppose you could directly observe ancestral habitat switches. Would that be strong evidence for adaptation? An association between habitat and genetic lineage is probably not sufficient to demonstrate the action of natural selection. On the other hand, frequent recombination could empower genome-wide scans for extreme association between genes and habitats, that would provide stronger support for adaptation. You can view a PDF of the presentation of this stimulating article in our journal club here.